Dogs that lick excessively have to be one of the weirdest dog behavior problems around. If your dog licking the carpet or funiture is creeping you out, here are some dog training tips for dealing with this problem. How Can I Stop My Dog From Licking My Face? But dogs that lick excessively seem to have gone out of control. Some dogs lick themselves until they develop bald spots. Others lick strange stuff like the carpet, the window screen, or the furniture, which totally mystifies the owners. First of all, don’t be alarmed as it’s quite typical for dogs to lick objects in their reach. When your dog greets you with a lick – she’s showing her affection for you – this is also how wild canines show their submission to the top dog. Licking one another is in dogs nature. However, if your dog is licking himself bald, take him to the vet for a check-up. Many cases of canine excessive licking are caused by fleas, skin irritations, allergies, or even arthritis. Yep, you heard right. Arthritis causes your dog’s joints to ache, and he’ll try to relieve the pain by licking himself excessively. The problem is that excessive licking, especially in the case of fleas or allergies, can make the problem area itch even more. The more it itches, the more he licks. This vicious cycle can result in sores and lick granulomas. If he’s licking his paws after a meal, he could be allergic to his food. Check the ingredient label. If one of the first four ingredients is corn, chicken, or meat by-products, find dog food without these ingredients. Beef or lamb is recommended for a dog with allergies. Once medical causes are ruled out, you can assume it’s a dog behavior problem. You may have to do a little detective work to figure out why your dog won’t stop licking. 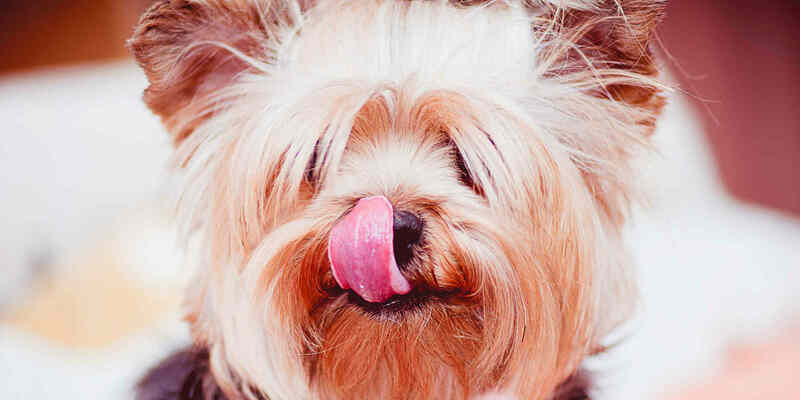 Your pet’s excessive licking may due to anxiety. The excessive licking helps him to feel better about something that’s bothering him. The worst part is that it can quickly become an obsessive-compulsive behavior. Try to figure out why your dog is anxious. Is he left by himself for hours? Is he bored? You may need to more time with your pet. Regular exercise helps dogs to burn up all their pent-up energy. An hour-long walk, once a day, can give your dog something to look forward to. Consider hiring a dog walker if your schedule is too busy for this. Think about when your dog gets your attention. Is it when he’s doing something strange like licking the carpet? If so, you’re reinforcing the very behavior you don’t like. Your pooch wants your attention and doesn’t really care if it’s negative attention, like when you’re yelling at him. Pay attention to him when he’s doing something you like. If he starts licking you, say “no,” and turn away and ignore him for a few minutes. If he’s licking the carpet, or something else, try to redirect him with a toy, and praise him when he plays with it. Be patient. With time and persistence, you can successfully train your dog to stop the excessive licking. 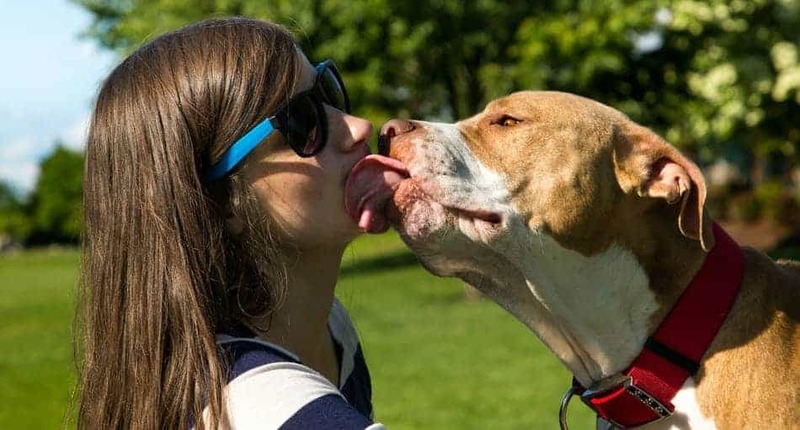 Why do dogs like to lick people’s faces so much? This is one dog behavior problem that really gets on people’s nerves since most people don’t like being covered in dog slobber all the time. It’s best to put a stop to excessive canine licking before it becomes a habit. In the wild, puppies lick the faces of adults so they can get fed. You probably don’t know that young dogs can’t digest meat well. Once they’re weaned, this would be a problem, except that nature provides it’s own version of puppy chow. When the pup licks her mom or dad’s face, this stimulates a regurgitation reflex in the adult. The pup is able to digest this meat since it’s already partially digested. Aren’t you glad you can go to the store to buy dog food? Dogs will also lick each other to show their respect, especially if the other dog is the pack leader. Although you may think face-licking is gross, it’s good to know that your dog is showing you that she considers you her pack leader. Many dogs also express affection by face licking, especially if you’ve been gone for a while. She’s reassuring herself that everything is still OK in her world. Since most people would rather not have a dog plant a big wet one on their mouths, you need to teach your dog you don’t like it. First, don’t punish your dog for licking your face. This is a natural thing for her to do, and punishing her will only hurt and confuse her. When your dog starts to lick your face or mouth, simply say, “no lick,” and get up and walk away. Totally ignore her for a couple of minutes. Don’t look at her or talk to her. Your dog wants your attention. If you withdraw it, she’ll learn that if she licks your face, you won’t pay attention to her. And if she doesn’t get your attention for doing it, she’ll stop. Be sure that everyone in the household is on the same page. If your kids think having your dog lick their faces is great fun, and they continue to allow him to do it, you’ll never get him to stop doing it. Being consistent is the key to successful companion dog training.